Wednesday, April 23, is Administrative Professionals Day. On this day, we take the time to thank those who help make the offices run smoothly: secretaries, administrative assistants, executive assistants, office managers, and the many others who fall under the administrative professional umbrella. These professionals do a lot to make our lives easier. Here are just a few things we have them to thank for. They handle client scheduling and can often deal with some of the basic questions clients have without bothering you. They answer the phones. It sounds like a small thing, but you’d be surprised how many phone calls you’d have to field if you didn’t have an administrative professional. They deal with your scheduling. Today, many use computer programs to see your schedule and add items to it. Then they make sure you know what’s going on so you can prepare for each meeting. They’re usually the office expert on using that giant copier/printer/fax machine/super complicated piece of technology that seems to always jam or have some other problem. They keep all the records for the office and can usually find whatever piece of information you need within a few minutes. They keep things fun! Your office manager makes sure birthdays are recognized, holiday parties are organized, and that the office looks good. They make sure you always have the tools and supplies you need to do your job. They’re the keepers of the supply closet, and they’ll make sure you’ve got plenty of those pens you like and the post-it notes you use. These are just a few things your administrative professionals do for you and for the office as a whole. Be sure to thank them on April 23! We can help by providing some amazing administrative professionals day flowers and gifts in Fort Worth, TX. Have you prepared for Administrative Professionals Day? It’s coming up on April 25th, and all administrative professionals know about it. This is the time to appreciate and honor those who keep the office running smoothly, make sure you’re always on time, keep your clients happy, answer the phones, do a lot of the office organization, and generally make your business run smoothly and without too many problems. Today, administrative professionals do much more than just take memos and answer the phones. While they do these tasks, they also must handle scheduling, coordinate meetings, know the most recent computer programs, be able to work increasing-complex office machinery, handle some accounting, and much more. “Secretary” no longer defines these hard-working professionals. If you found yourself without your administrative professional, your office could easily fall into disorganization. Think about it. Without these people, you would have to take the time to schedule meetings. That involves setting a time and date when everyone can attend, which can be very difficult if you don’t have everyone’s schedules handy. You’d also have to answer the phone and handle all of the clients yourself. When would you ever get work done? Even if you see clients all day long, you’d constantly have to interrupt to handle other clients on the phone or who just dropped in. Without your administrative professional’s wisdom, grace, expertise, organizational skills, and humor, you would have much more to handle. 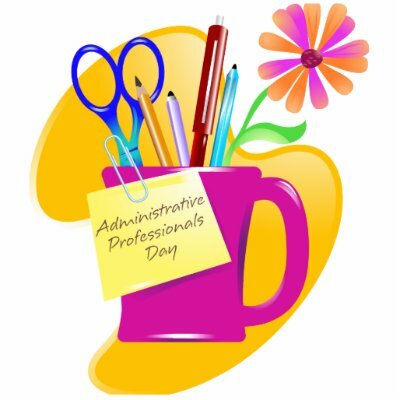 On April 25th, take the time to show these administrative professionals just how much you appreciate them. Take them to lunch, get them flowers, or have an office party. Just don’t forget to do something—they DO know about Administrative Professionals Day, and they won’t forget if you forget! Want to order your administrative professionals flowers? We’ll help! Take $10 off if you order flowers for your administrative professional between now and April 20. Just use code BL2 at check-out.